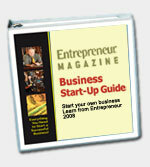 BusinessMart.com strongly recommends Entrepreneur Magazine's Vending Business Start-Up Guide. For more information read below. To purchase this book click on BUY NOW. Americans feed vending machines more than $22 billion each year for sodas, candy, coffee and other quick snacks. That's a nice chunk of change--and our Vending Business guide shows you how you can get in on the action. Vending gives you an ideal way to ease into your own business. Maintenance is minimal--in fact, the biggest part of the job is collecting your money: You can start part time, working out of your home by placing a few machines in local businesses. Then, as your customer base increases, invest in more machines and grow your company as large as you like. We show you all the tricks of the trade, including how to best place your machines, where to get supplies to fill 'em up, where to buy new machines at a discount, and how to manage your accounting. With new games and coin-operated entertainment being introduced all the time, new moneymaking opportunities are opening every day. Don't miss out. Order now!